Where Franz Schubert's Lieder are concerned, I am more a cultivated intuitor than an expert. I have not taken the time to hear multiple upon multiple performances of any given song. In fact Dietrich Fischer-Dieskau in his early cycle for Angel Records forms the core of my by-now lifelong listening, spiced by Elly Ameling and a few others. I can't say that I feel the lesser from the experience. I mean to say that these versions have served me quite well until now. 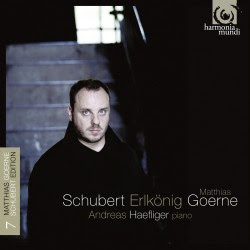 So hearing Matthias Goerne's latest volume of his Schubert cycle, Erlkönig (Harmonia Mundi), I did not know what exactly to expect. It was in every way a revelation. Goerne is a master in his own right, every bit as dramatic and dynamic as Fischer-Dieskau. Andreas Haeflinger accompanies with great spirit. These recordings are the product of someone who has been singing the lieder throughout his career. They give an equally valid, but refreshing change from the late Fischer-Dieskau's way. The vocal instrument is on a par but different enough to give the music new voice. And now and again he scales heights that those old Angel recordings don't quite.